What did you train today? I know, I know. You’re busy. There are classes to attend, entries to fill out, trials to travel to, let alone jobs and human family and other obligations. Finding time to train can be a very real challenge. Trust me, I am right there with you. Last week was different. 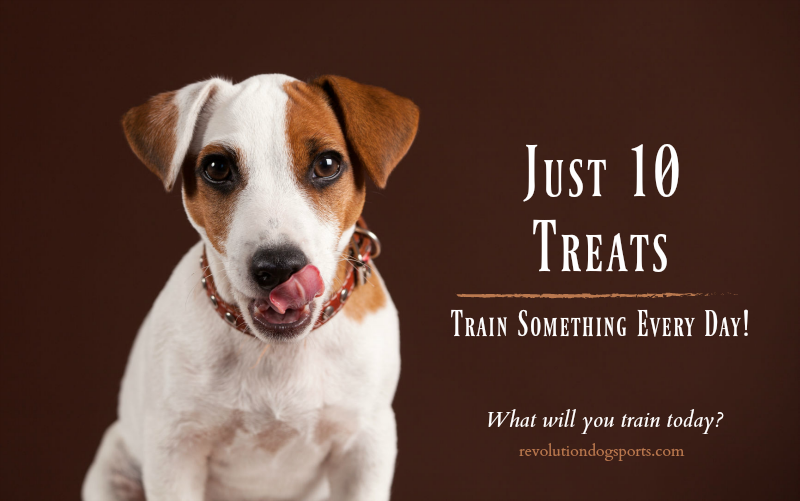 I accepted the challenge of friend and fellow trainer Michelle (Las Vegas Dog Sports) to train every day with at least 10 treats. Each day I worked with Blade on a leg weave using just ten treats. By the third day, she had been rewarded THIRTY TIMES and by Sunday? At least SEVENTY TIMES but actually she was rewarded even more because as we got going, we were having so much fun we did a couple more sessions! That’s a lot of rewarding for a new behavior with JUST 10 TREATS! Today is Monday and it promises to be another very busy week. I am challenging you to join me for Just 10 Treats. Select one behavior you’d like to work on. Now, prepare 10 treats and train the behavior until all 10 treats have been used. That’s it! Almost. Tomorrow, use 10 treats to work the behavior again. And the next day? Same thing. Think of it, at the end of 3 days your dog will have been rewarded THIRTY times for the behavior. At the end of 7 days? SEVENTY times. Need some motivation? Sharing your progress keep us accountable as well as provides you with support from your dog sport community. Nervous? Don’t be! You won’t be alone. I’ll start. Blade and I will be working on Going Around a Cone. Share your progress in our Facebook Event!